Also known as Temminck's Golden Cat, the Asian Golden Cat (Pardofelis Temminckii) is a wild cat of medium body size. Weighing approximately thirty pounds, the cat roughly equals a small dog in size, with an average length of four feet including the tail. Long considered to be closely related to its African cousin, the Asian Golden Cat is a resident mainly of Southeast Asia. The coat is usually plain and coarse with the color ranging from red to golden in shades. Melanistic specimens are often seen as well. Spots are seen on its trunk in certain parts of the geographical range whereas the belly and under parts are usually light in coloration. White lines run across its cheeks and from the inner corners of eyes to head. The tail also has a white line on the under surface near its tip, which is also white. In northern parts of its range, the cat often has dark markings including rosettes and stripes, bearing close resemblance at times to the leopard cat. 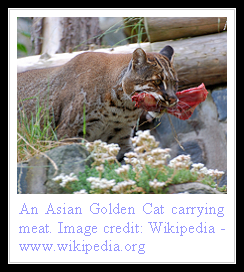 A secretive and solitary predator, the Asian Golden Cat is believed to hunt mainly at night. Birds, lizards, rodents and small ungulates are reputedly taken. Scavenging has also been recorded for this particular feline, though larger animals including wild boar and young buffalo calves are also reputedly hunted at times - the felines operating in pairs to bring them down. Not much is known about the behavior and reproductive profile of the Asiatic Golden Cat, though it is believed that males participate in rearing of the young. Mostly one kitten is born after a pregnancy lasting around eighty days. Maturity is reached at at between one and a half to two years of age. Life span in captivity is known to be up to twenty years. Principal threats to this beautiful animal include deforestation and hunting for its pelt and bones that are being increasingly utilized in Chinese traditional medicines. The cats don't breed well in captivity and are currently classified as vulnerable. i thought that they were endangered, not just vulnerable. They had been definitely endangered, generally speaking. But the scientific classification according to the IUCN system was previously 'Vulnerable'. At the moment it is 'Near Threatened'. I hate the Chinese!!! Blady awful people with their pathetic beliefs about shark fins and anything else that moves past them that doesn't get away from them in time!!! Savage people! Well I usually like big cats but not these ones..to be honest! Wish you the best of luck for all your efforts. I wanted to leave a little comment to support you and wish you a good continuation. I appreciate examing what you had to say, You have an splendid knowledgeon the subjectfactsand I look forward to studying more of what you have to disclose. thats one pritty kitty lol you all are awesome if u seen this! I appreciate this work amazing post for us Custom essay I like it. I personally like your post, you have shared good article. Help With Matlab Homework It will help me in great deal. Wow! The breed looks so cool! Thank you for sharing!